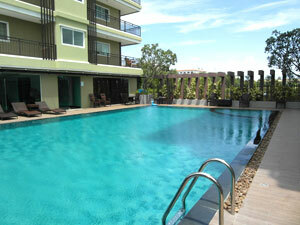 Porchland 2 in Jomtien Pattaya Thailand. A nice new & modern Condominium by a beautiful lake with a very nice swimming pool area, good quality fitness center/gym and free wifi. Great modern condominium complex only approx. 750 meters to a nice stretch of Jomtien Beach in Thailand. 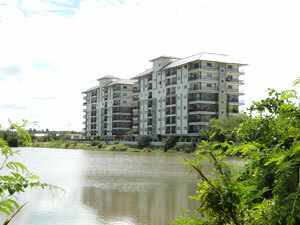 Quiet and peaceful location situated by a lake across from Baan Suan Lalana. If you like it peaceful and somewhat secluded this may be for you. 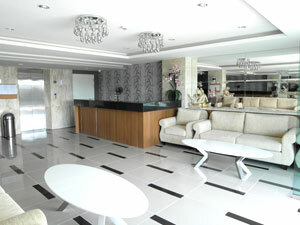 Click here for a Google location Map of Porchland Condominium 2 Jomtien. Opens in a new window. 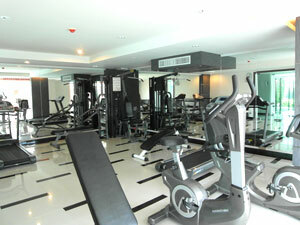 Communal swimming pool, fitness center, parking, 24 hours security.